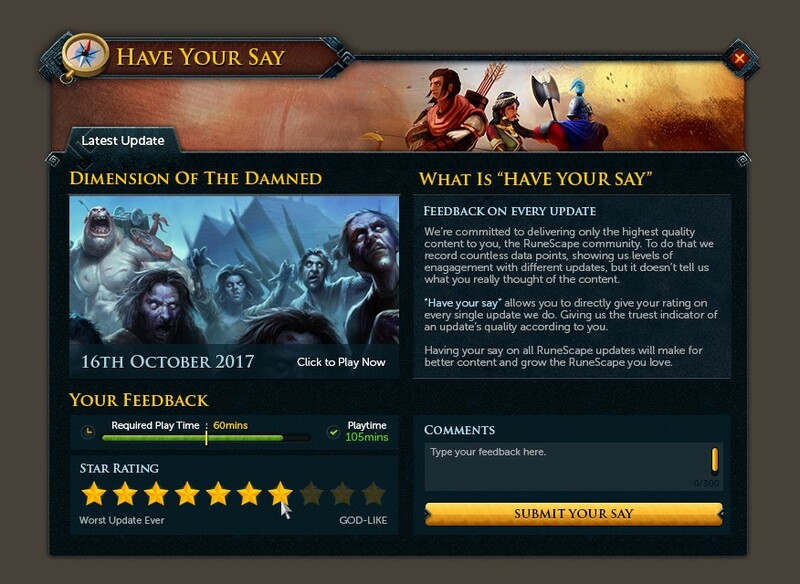 In recent weeks, there’s been a lot of discussion and concern from parts of the community about the update quality and use of micro-transactions (MTX) in RuneScape. Our lack of response has made us seem distant and uncollaborative, making frustrations worse, and for that we are truly sorry. We’d like to reassure you that the time has been spent deciding on the right changes. In this post we’ll cover the immediate actions being taken and the larger changes we’ll build towards in the longer term. First, thank you for your comments, ideas and complaints - yes really! Your care for the game shines through. You’ve seen content quality and quantity start to slide, seen MTX promotions march on regardless and Jagex going quiet on the matter. You’re worried that this will just get worse and are concerned for what it means in the long term. We hear you, and we shouldn’t have let it get to this point. It is incredibly important for us as developers that RuneScape has a long and healthy life. An essential part of that is providing players with new content, improved features and solid overall service. The balance we try to strike is that MTX is a major part of the game’s income and directly relates to the amount we can invest into its continued development. Without that income stream we would have to massively cut back on investment into the game and we feel that would be very damaging for RuneScape and the community. That being said, it's clear that parts of the community feel we’ve neither delivered on the content nor got the balance with micro-transactions right. Therefore, we’ve looked critically at ourselves to understand what happened and how we can do better by you. On the content side, though there have been some good updates, you’ve not received consistently strong releases throughout this year. There are a few factors: moving toward and then away from the expansions strategy resulted in a lot of wastage; we picked too many long-term development projects at the same time, stifling regular releases; and we moved a few developers to focus on building the mobile client before we’d hired their replacements. Also, our desire to not over-promise in the RuneScape Reveals at RuneFest made it seem like we’d lost our ambition. We can – and will – do better. The content roadmap has been remade in recent months, directly driven by player requests, and we will be doing a new community survey soon to make sure our content plans are the best they can be. We have also changed our development processes to get more of the updates you want in production and to ensure they're being released more regularly. We will soon be adding a content rating system into the game itself so we can gather feedback from everyone on new content as you play, which in turn helps us respond better. Image showing a potential design of the in-game feedback system. Click to expand. We are also bringing in new development team members over the coming months to give us greater capacity to deliver on content quality and make the mobile client a reality for you. These changes will bring a consistently good flow of content and we are going to be showing you our new team structure and progress on new updates in news posts, live streams and videos in the coming weeks. The mobile client will also be transformative for RuneScape, offering a lot of convenience to current players, as well as bringing many lapsed and new players. We’re confident that together these things will make for a strong year ahead for RuneScape. On the MTX side, we let the balance tip too far and promotions seemed to dominate the game, especially when coupled with underwhelming content updates. The Prize Pool promotion design was misjudged and it crossed the line. While MTX in RuneScape is essential to maintaining our development teams and the content they produce, we believe it can be refined (and the harsher edges smoothed out) without significant dents to income. Rest assured, we certainly won't be pushing it any harder. The Prize Pool promo won’t ever be seen again and we don’t intend to revisit similar mechanics any time soon. Over the next few months we will be experimenting with promotion configuration, such as duration, start days and marketing levels, to see if there are better trade-offs between visibility and revenue. For one of the first experiments we will not be running second-chance-Tuesday for the rest of the year. We commit to keeping a detailed eye on the game economy and progression rates to ensure promotions aren’t going to cause major impact. And to help in the longer term, we are starting a rework of Treasure Hunter, which will have greater emphasis on cosmetics and conveniences. It is important that we don’t over-promise; to be clear, this doesn’t mean the end of Treasure Hunter promotions. What we are committing to is better managing their impact, duration and regularity, making some immediate changes in the short term while looking to move to a more balanced approach in the mid to long term. In terms of communications, we've not talked to you enough. We'll pot-up defence and communicate more, show you all what we're working on and better explain our decisions. While we as the game’s developers sometimes seem to have other priorities, we care deeply for the game too. For most of us here RuneScape is at the centre of our lives and careers. We don’t always get it right, but hopefully you can tell we are as passionate about the game as you are. Hopefully you can see we're making some immediate changes and planning long term improvements. You can help us too, by making the RuneScape community the most positive and welcoming place possible. After all, the more players we have the less reliance there is on MTX revenue. Our overall goal is to deliver you frequent, high-quality content updates, bring the game onto more platforms, and tune MTX to be less abrasive. We think this is the right approach to ensure RuneScape remains healthy. And overall the game is still robust: In the last year membership has remained stable; RuneFest 2017 was the biggest and most popular yet; and our marketing efforts are ramping up to bring in new players. With strong content and mobile coming next year, 2018 is shaping up to be a great year for RuneScape! Many of your most desired projects are well into development and we're looking forward to the livestream tomorrow where we'll show progress on Pirates Quest, Deep Sea Fishing, Clue Scroll Overhaul, Mining and Smith rework, the all new Solak boss, Combat Pets, the upcoming Halloween Quest, and Evil Dave! Tune in to the extended special from 15:30 UTC! I'll believe your promises of improvement when change happens. We've been lied to way too many times to take any statement at face value. Regurgitated sh*t we've heard before just with a bit of seasoning on it this time. Removing 2nd chance tuesday was the least you could do and is a step in the right direction. I like how you had to put you will never bring back the prize pool in bold like it is a hard hitting statement that really proves you guys are doing something. I think we all knew already that was never coming back based off the initial reaction from players and j-mods alike and if it did, you would be shooting yourself in the foot. Personally was expected a bit more out of this statement. I was hoping you would be removing the more op xp gaining mtx (smouldering lamps) whilst focusing more on cosmetics. I chuckled at "
" With the absolute massive turnover you guys had it makes me wonder how little gets reinvested into the game to improve updates and prevent delays and what just gets handed over to the chinese overlords. Hopefully Rite of Passage comes out soon. I have been waiting years for it. "You’ve seen content quality and quantity start to slide, seen MTX promotions march on regardless" - March on, doesn't seem the correct term since they are becoming more and more frequent, "increase in size and quantity" would fit better? "We hear you, and we shouldn’t have let it get to this point. " - +5 Kudos! "It is incredibly important for us as developers that RuneScape has a long and healthy life." - Both are important but I feel and im sure others feel that (health > length) to a degree. Some MTX to keep the game going is fine, but no one would want to see Runescape on an MTX life support machine. "we moved a few developers to focus on building the mobile client before we’d hired their replacements." - With all the emphasis and man power put into mobile, I hope it's a hit but I feel you shouldn't get your hopes up as I cant see this game being played that much by new players on mobile, maybe people already playing as an aid to skilling. "We can – and will – do better." - Cough by releasing this just before you finish work cough. In honesty I dont mind to much, but I hope this wasn't posted at a late hour so questions people ask today can be ignored. "We will soon be adding a content rating system into the game" - From the picture I can see (1 = Worst update ever and 10 = God-like). I think its a good idea but I think it should ba changed to (1 = Sliske's endgame maze and 10 = Ash). "The Prize Pool promotion design was misjudged and it crossed the line." - When you say "misjudged", do you mean by Jagex or us players? "The Prize Pool promo won’t ever be seen again and we don’t intend to revisit similar mechanics any time soon." - any time soon? Please just say never. All in all thanks for the report. This comment is nothing you guys haven't said before Don't stand up for whats allowed, stand up for whats right.